I’m writing from the bus. It’s almost raining and I’m soaking wet. 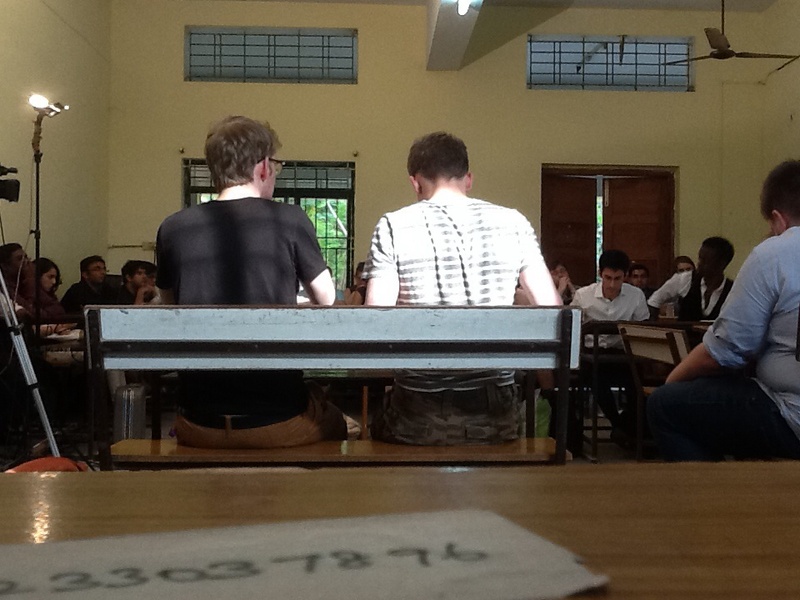 The one time it rains in Chennai is when we’re all waiting for results outdoors….typical at this point. Today was a ball of stress and nerves. If you haven’t heard. Out of the 4 Scottish teams sent to this competition, 2( St. Andrews and Glasgow) have semi-finaled. An absolutely incredible show. This house believes that Japan should shame it’s WWII vets regardless of whether they participated in war crimes. This house would allow the sale for profit of cities in bankruptcy. A few instances from the day. I met a debater who was PM in St. Andrew’s octos and quarters who debated with me in Texas during high school. Small world. WOAH. ‘Alex and Roo are jumping around, something good must be happening. Roo asks deputy, will the Japanese majority accept it, Yes, Roo get’s happy, I can guessss his extention. Roo turns prop case on it’s head. And points out they’re a-historic; such a historian. More crazy stuff from the day. Alex saved a bat (like an actual bat) today after it jumped on a man with his sweater, cute. More on Alex, he has apparently written a blog post now which I’m supposed to share. It’s cute to see him jealous. 😉 It is posted below. You may have noticed this thing has gone through a renaissance. I’m not going to give my writing style any credit, but I will say that I am probably the first one who knows how to use wordpress and how to post a picture. Moreover, I watched Roo slam his face into a window. It went something like this. ‘Woah, look at the lab equipment in that room.’ Roo leans his head in for a look, I guess he thought their was no window (classic Chennai). He slams straight into a pane of glass. It’s crazy how such a smart man can be……..well….. Finally, I had my public speaking round early this morning. Check out this efficiently. One round, two rooms, 30 speakers each. 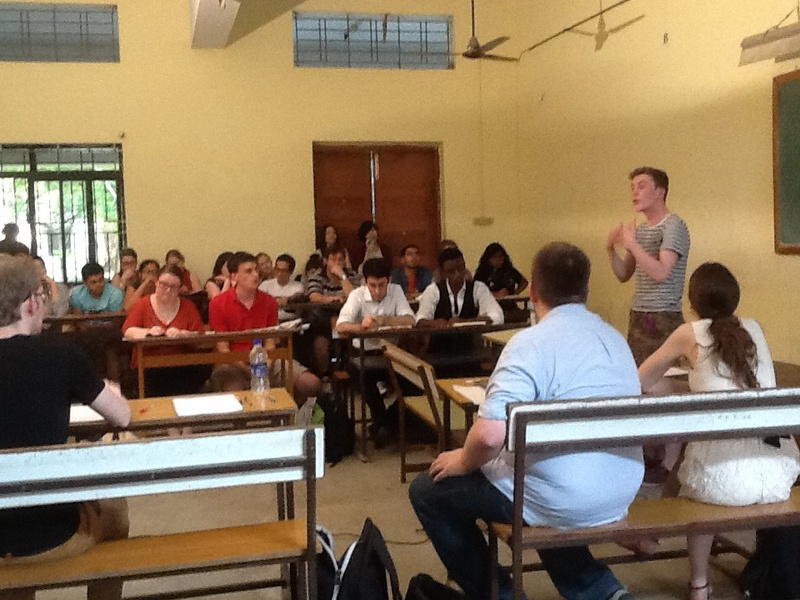 Out of sixty total speakers they break 4 straight to finals (only in Chennai).Wow. Luckily for me I heard only about 10 people came to my room. So I guess I’m at about a 20% chance of breaking, will find out tomorrow. My topic was about a point of my life that changed me. I stole my law school essay topic and talked about the time I was in my friend’s neo-modern German house and couldn’t tell the shower from the sink. We’ll see how it goes. The picture above represents everything this tournament is about. Holding on to the good things. 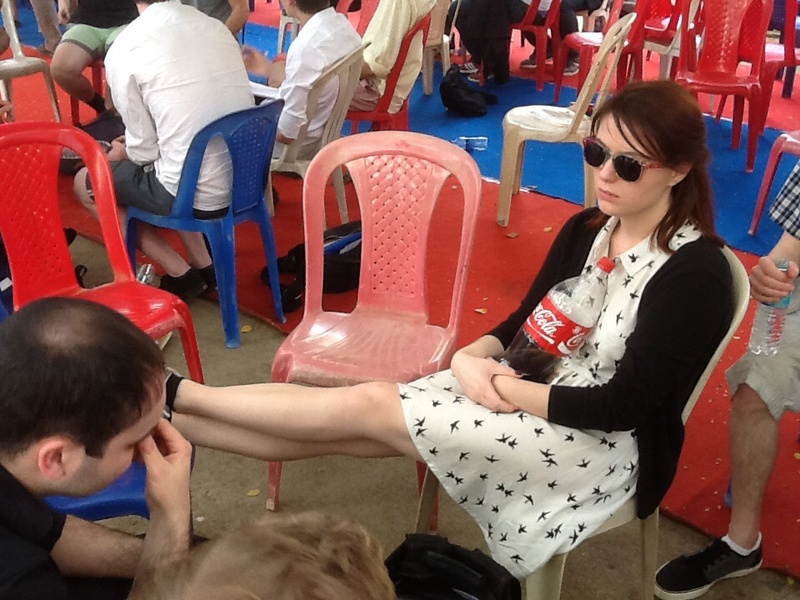 Waiting around in the heat of the day at a disorganized tournament, Kitty finds solace in a warm bottle of coke. “I’m currently surviving off a diet of muffins, curry and soda”. We all are Kitty, we all are. So tired. As usual the tournament ran over. There will definitely be at least 2 Iona teams in the final, a very good show. Unfortunately, they will be running on about 6 hours sleep by the time we get to the hotel and may be sick after being in the rain for awhile. We’re having to switch busses now for some God only knows reason in the middle of the night. So I can’t write for much longer. Alex is driving everyone up the wall. It’s all about the reaction to the break. Kitty, Roo and Ben preoccupy themselves with being nervous for tomorrow, while he gets really loud and happy. We’re all tired, on our last nerve, this could be a recipe for disaster if he doesn’t shut up soon. Will our team breakdown before the semi-finals tomorrow? How is that for a cliff-hanger? Will post again tomorrow night. xoxo Gossip Parker – No complaining policy broken already, my bad.